I am trying to evaluate Atmel Start (comparing it with coding "on the bare metal"). I am at the beginning of my experiences with the SAM D series, and a complete noob when it comes to Atmel Start. My first test is to generate a project using an SERCOM/USART. After a bit of tinkering it seems to me that the I/O multiplexing chosen by the Atmel Start "code generator" is SERCOM-ALT. E.g. for SERCOM0 the auto-chosen I/O pins are (Rx/Tx) PA05/PA04. Can I change the port multiplexing to SERCOM (rather than SERCOM-ALT)? How? Why would you care whether it thinks you need SERCOMALT? I assume that the initial choices there are valid ones, and thus the deduction that those settings will result in code that will use SERCOM-ALT. I confessed right from the start that I'm a total noob re Start. I am trying to understand how this thing works. Now, when I poke around in the form above I can select just about any portpin for e.g. the Rx. It seems everything is possible, yet the data sheet for the D20 seems to be very clear that its not. 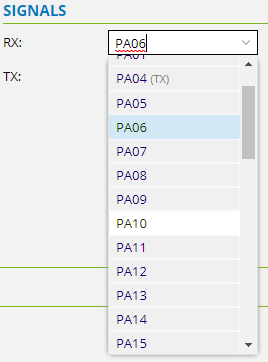 Looking at the dropdown contents all choices but PA09 are gray, as in "not selectable" or "invalid", but I can select any of them just file. Notice that PA5, which is a possibility given muxing with SERCOM-ALT, is gray. That should be a valid choice, yes? I am trying to understand this UI but it makes no sense to me at all. I am not (pimarily ;-) ranting. I am trying to ask an honest question about how to this thing works.